Just like my last post from this series I will try not to waffle on about these products as you have all seen them before and I want to do individual full reviews on some of them so I will try to keep it short and sweet. So this is my make-up bag which you have all seen from my recent Primark haul and I instantly snapped this up for £3! It’s so spacious and all the products below all fit in it with extra room too.. so if you’re looking for a new spacious make-up bad, go to Primark!! Nivea Express Hydration Primer (Dry Skin) – As many of you saw on my review of this you will know that this is my go to primer at the moment it creates a perfect base for my foundation and makes it last a really good amount of time throughout the day. Rimmel Wake Me Up Foundation (Ivory) – Now this has been featured on my blog too many times to count, I love this foundation and as it has almost ran out I thought I would finish it off whilst i’m in London but using it on the days where I’m looking extra extra tired (which has been everyday this week!). Rimmel True Match Foundation (True Ivory) – Featured just over a week ago in my London essentials haul, as my other foundation was running low I purchased this as so many bloggers are raving about it and I too can completely agree with everything they day about this foundation. Full review coming soon! Rimmel Wake Me Up Concealer – I featured this in another one of my hauls and I picked this up as I was in need of a concealer that made me look more awake and reduced any bags under my eyes. From the foundation working it’s wonders I thought the concealer would do the same and it does! Check out my full review here. Rimmel Clear Complexion Clarifying Powder – A product that has never been featured on my blog! Every girl has to own a pressed powder to set her foundation and me being a true lover of Rimmel I ,of course own one of their pressed powders and I cannot rave enough about this. I will do a full review when I repurchase this which should be soonish. Sleek Blush by 3 Palette – I featured this palette in a haul a while back now as I loved the idea of three blushes in one palette in a variety of colours which I could also blend together, genius. Sleek Contour Palette – Again a part of the same haul I also got this Sleek Contour Palette which contained a contour powder, highlighter and blush but the contour shade I could also use on my eyebrows if I was on the go and I loved the idea of four products in one. I use this on a daily basis and I cannot rate is highly enough especially as it is only £9.99. You can read my reviews on both of the Sleek palettes here. Nars Blush ‘Luster’- Now I know I only featured this yesterday but it has already made itself at home in my make-up bag and having only used it once I can’t really say a lot, I’m still too excited about purchasing my first Nars product! 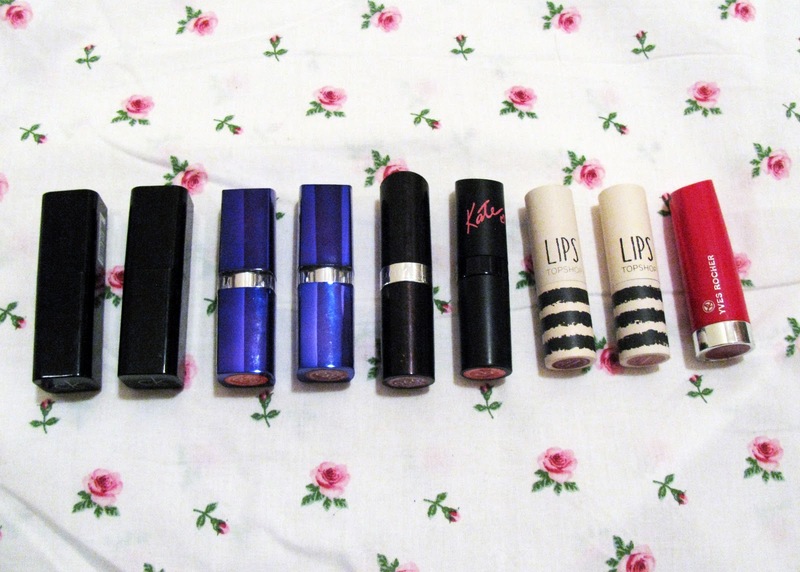 I’m not going to babble on about my lipsticks as I have already reviewed all of my Rimmel Lipsticks here and I will be reviewing my CK lipsticks and Topshop lipsticks very soon for you all, but I will list the shades below for you all. 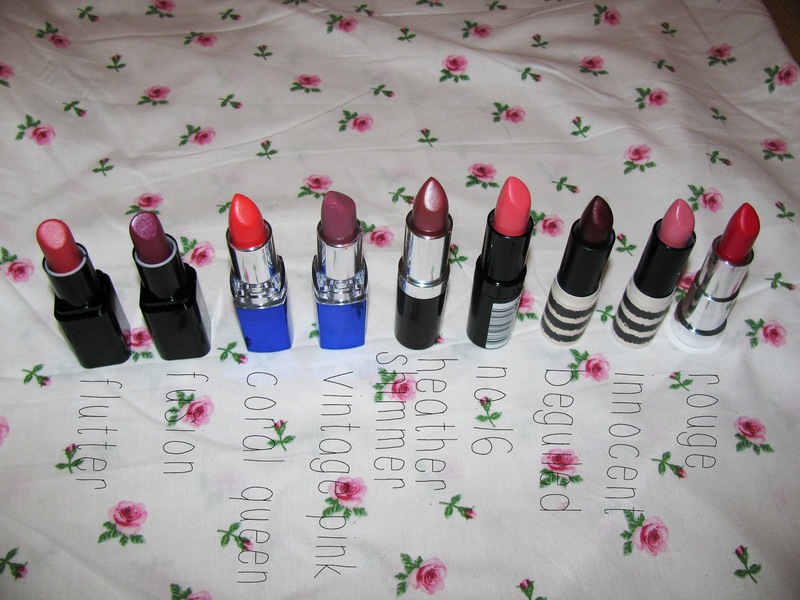 Rimmel: Coral Queen, Vintage Pink, Heather Shimmer, Kate Moss no.16. Yves Rocher: Rouge (received in a recent Glossybox). Carmex – I don’t think I’ve featured this Carmex on my blog, this is the original Carmex which I picked up from Primark (yes Primark sell Carmex) for £2 and I have never looked back. Honestly if you have never tried out a Carmex you need to, it does wonders for your lips. Review coming soon. Vaseline Pink Bubbly – As this was a limited edition Vaseline of course I was going to snap this up. I own far too many Vaseline’s as the are so easy to grab and throw in a bag or pocket and most Vaseline’s work wonders for your lips apart from the pink tinted Vaseline but thats another story. Jason Lips Bee Healthier – I received this in my January Glossybox and it was the only product out of the whole box that I liked as it honestly leaves my lips feeling so smooth and moisturised! You can read a little more about this lipbalm here. Blistex Relief Cream – I always use this stuff just before I go to bed so that when I wake up my lips are all moisturised and not in their usual cracked, dry state but I don’t use this throughout the day as it isn’t an invisible lip cream, but if you have a problem with dry lips try this out! Collection Skyscraper Mascara – I have featured this mascara at least once on my blog and honestly this has got to be the best mascara ever! I never repurchase the same mascara but this one I will be, it is so good at lengthening lashes but without emptying half of the contents of the brush onto my eyelid. Soap&Glory Supercat Eyeliner Pen – I featured this in my Boots haul a few weeks ago and this has just reminded me that I need to review this and I will soon but it is a really good eyeliner pen and the nib makes it so easy to apply without making a mess of your eyeliner. Rimmel Super Kohl Pencil Eyeliner – Trusty Rimmel again, I have had this eyeliner for quite some time now and it’s taking a while to use up which shows that it is value for your money! It applies so easily and lasts such a long time throughout the day. Every girl has to own a pencil eyeliner. 2True Effortless Eyeliner – I don’t want to admit the fact that I have this eyeliner for at least 2 years but it’s something that has always stayed in my make-up bag to touch up my eyeliner and i’m actually shocked to think how long I have owned this.. maybe I should invest in a new liquid eyeliner. Urban Decay Naked Palette 2 (Dupe) – I bought this on eBay a while back and to my annoyance this is not a real Naked 2 Palette but I still use this on a weekly basis as I’m not going to not use it as I paid a fair bit of money for it and the shades are almost identical to those in the real Naked 2 Pallete just a lot less pigmented. You can see my review on this dupe here. This is not a real Naked Palette 2, don’t ever trust ebay sellers! Model co. Eyeshadow Duo – I recieved this in my February GlossyBox and I was really happy with this, the eyeshadow shades were right up my street and I use this on a weekly basis! You can read a little more about this duo here. Germaine de Capuccini Flawless Eyeshadow Trio – I bought this from a local salon and I have never come across this brand before or since but I use the brown shade to fill in my eyebrows and the other shades as eyeshadows on a weekly basis as they are really nice natural shades for a basic eye look. I honestly could not tell you the brands of these make-up brushes so instead i’m just going to list what I use each brush for..
Foundation brush, foundation brush, eyeshadow brush, powder brush, eyebrow brush and tweezers. This post took me so long to write you guys would not believe, so I hope you like this post and have found some of the reviews linked useful!